Over anything else I could not survive this disease without this scale. Seriously! It is essential to carb counting foods such as porridge, rice, potatoes and pasta. And because of the fluctuation in the weight of fruit, I weigh them too. I have read that a lot of people go high after eating carbs like the ones listed above, I do too, but not if I weigh them. It’s an accurate count so you can’t go wrong providing your carb / insulin ratio is on point. I’m a girl who is on the go fairly often; hopping from classes, to meetings, training or rehearsals so I need my food to be all set. Preparing my food not only helps with my strength and weightless goals but it is great to know the exact carb count in order to avoid those pesky lows or highs whilst I am out and about. I tend to use airtight containers so they keep the food fresh and avoid any leakage. This wonderful invention is essential for parties and nights out. For a full year of being on the pump I had a dress in the wardrobe that I had never worn because I was thinking “where will my pump go”. Having to wear the pump also dictated any future clothes shopping trips. It wasn’t until I wore some spanks and posted a picture on instagram that I found out about another option. 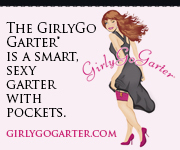 A company called Girly Go Garter commented and said “we have something for that”. I bought one straight away and have been very happy with what I wear ever since. Especially those skin tight dresses. Plus, spanks don’t make it very easy to go to the toilet. Although I don’t turn to them very often, dextrose goes with me wherever I go. They are small and very quick to treat a low. I carry them in my purse on nights out and I have a couple in my meter case next to my test strips. They are the back up of my back up (Lucozade), but I just don’t go anywhere without them. I think there are other things, but the Girly Go Garter, Dextrose, Scales and Tuppaware are my main essentials. What can you absolutely not live without besides the obvious diabetic equipment like your meter, test strips and insulin?